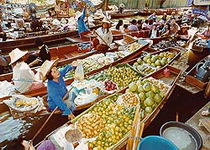 Trip Description : Visit Damnoen Saduak Floating Market including an opportunity to experience Thais rural life and a charm of countryside. 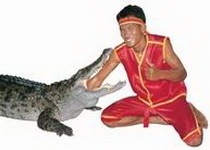 Then, process to the Sampran Crocodile Farm to see the Crocodile Wrestling and Greatest Elephant Show. 07:00 Meet your English-speaking guide in the hotel's lobby. 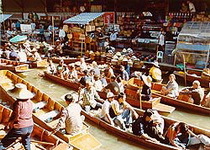 Depart for Damnoen Saduak Floating Market, situated 110 Km. west of Bangkok. Your journey commences with a leisurely drive through rice paddies and salt fields. En route we visit farmhouse along the way and watch locals produce sugar from coconut. The tour continues with a 30 minutes speedboat trip along fruit plantation to see Thai houses and the traditional way of life. Arrive Damnoen Saduak Floating Market. Here you will be fascinated by boats of various shapes and sizes used by local merchants to ferry their goods. 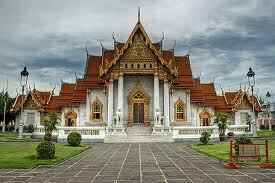 10:45 Depart floating market to visit the wood carving factory. 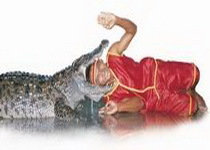 Then head to Samphran Crocodile Farm for buffet lunch. large variety of food served buffet style with warm Thai hospitality. See the Greatest Elephant Show in Thailand, an elephant show complete with dramatic sounds and narration Watch a ceremonial rite to bless the buffalo hide cord before hunting the elephants. Be entertained to football jumbo cup, dancing and at play from well-trained cutes. And re-enacting Yutha Hathi, an ancient battle scene on elephant back in full battle gear. Free at leisure to see the life of difference animals in the zoo, riding the elephant , picture yourself with tigers, etc. 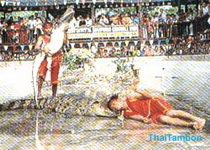 15:00 Depart from Samphran Crocodile Farm to Bangkok. 16:00 At the end of tour will be visit the local product store. Then tranfer to your hotel.